Rhubarb is almost here!!! You can already find the hot house rhubarb from Puyallup at QFC and Fred Meyer (and possibly other stores, that’s just where I’ve seen it). 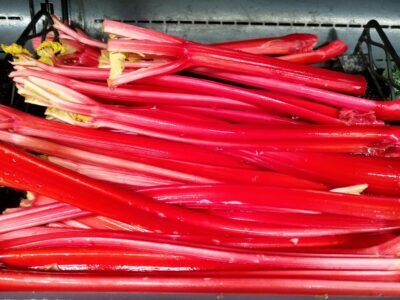 Rhubarb will be all over our farmer’s markets very soon! I had lots of rhubarb sauce on ice cream growing up here in spring and early summer, but I didn’t really learn to appreciate Rhubarb until I lived in Alaska, where it is welcomed with a thrill that means summer is really, truly coming. Alaska is also a place with the BEST baked goods, and rhubarb everything is around all the time! The first place lived in Alaska was Skagway, known as Alaska’s Garden City. Rhubarb was everywhere, including in the yard of the historic house I lived in. When I moved back home to Seattle, I was determined to never take this tart spring treat for granted ever again. A touch of spring fever and rhubarb cheesecake was born! 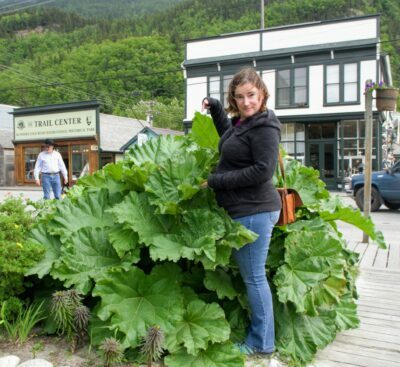 One of the many giant rhubarb plants in Skagway, Alaska. Later in the season it gets at least as tall as me. This picture was taken when I was visiting in June a couple years ago and it hadn’t yet reached it’s full height! Rhubarb is extremely tart and it is going to involve some sugar. 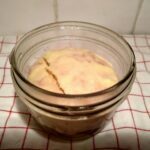 This cheesecake is a great way to have a lower sugar (24 g of carbs per individual jar) in a dessert. It has the same amount of sugar as a cup of nonfat strawberry greek yogurt and about a third of the sugar in a Costco muffin! As for the cheesecake, I love cheesecake but I always had terrible luck making it. I could never get it to bake all the way through, and it requires a pan you can only use for one thing! Our small kitchen does not accommodate any single use tools. 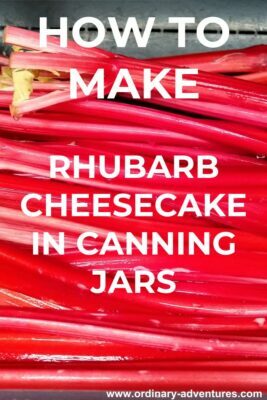 I do a lot of canning and a few years ago I started experimenting with making other things in canning jars and I especially came to love making cheesecake in canning jars because not only is it easy, you can put the lids on and freeze them! This is a really fun way to have a super fancy dessert on a picnic too! They travel really well with their lids on so they can be a great thing to bring to a potluck. If you’re serving them at home, they are easy to serve (just give your guests the jar and a spoon) and easy to clean up. My favorite meal to have rhubarb cheesecake with is homemade pizza after a hike! Creamy, delicious individual cheesecakes featuring that spring and early summer favorite, rhubarb! These also freeze really well for future use and are lower in sugar and gluten free! Use a baking dish (you might need two depending on the size of your dish) and place a dish cloth or cloth napkin to cover the bottom. Set the mason jars on the cloth. Make the crust: mix the melted butter and crushed walnuts into a paste. Spread the paste evenly among the jar bottoms. Use a wine cork (or another small blunt object) to press the walnut/butter mixture relatively evenly across the bottom of each jar. Make the cheesecake: Using a stand or hand mixer, mix the cream cheese, sour cream, sugar, eggs and vanilla on high until smooth. Pour hot water around the jars, so that the jars are in a water bath up. Fill until the water comes about a third of the way up the jars. Remove jars from oven and from the water bath. Allow them to cool completely. Serve with additional rhubarb sauce poured over the top and whip cream if you like! The magic of these cheesecakes is that not only does the flavor of the rhubarb taste amazing, but they can be made way ahead of time and can live in the freezer for at least a couple months (if you can wait that long!). They’ll also last several days in the fridge. To make them last, add the lids and rings to the cheesecakes and then you can stack them in the freezer or fridge.